Michael Schlow has taken the “high road” here, introducing his Italian cuisine to the ’burbs. : Translated as “high road,” Alta Strada is a neighborhood eatery with an interior sporting brick walls and bare wood floors. 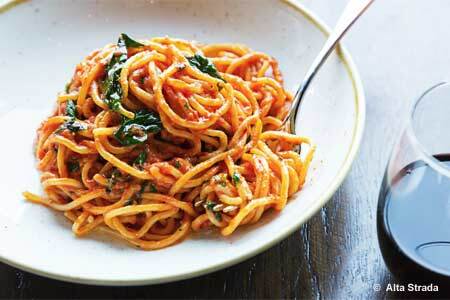 The solidly executed menu highlights fresh antipasti, crispy pizzas and homemade pastas. Slightly sophisticated takes on Italian food (think spicy green beans with prosciutto or olive oil-touched homemade ricotta with crostini) are served up on small plates (antipasti comes in three sizes) meant to be shared. There are staples like fresh cheese ravioli with tomato and basil sauce and tagliatelle alla Bolognese. Simple crispy chicken with Swiss chard, roasted mushrooms and prosciutto was an unexpected find. Vanilla bean panna cotta with fresh fruit proved to be a winning dessert. The small all-Italian wine list is approachable and reasonably priced. There is a second location at the MGM Grand at Foxwoods.